DynSite is a shareware client for MS Windows. With shareware means that you are free to try the software for 30 days but then have to pay 16 Euro. 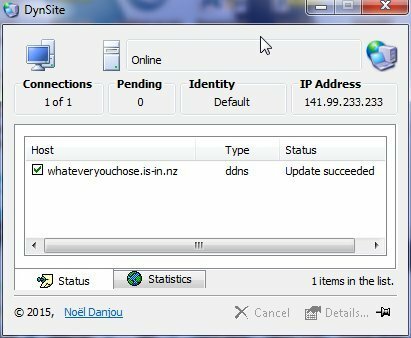 The program provides a graphical interface where you can make all the settings, however, it requires that you first create a configuration file for is-in.nz. You can download a complete configuration file here. To install this file, double click it. The program runs in the background with an icon in the notification area in the lower right corner. To change the settings, right-click on the icon. Install the program according to the instructions supplied. 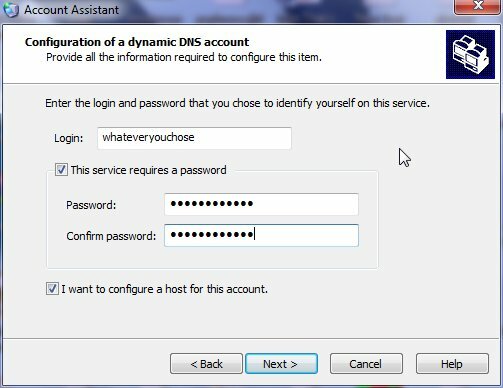 In DynSite there is a step-by-Step Guide (Wizard) that is used to add an account with a supplier, this is called Account Assistant. 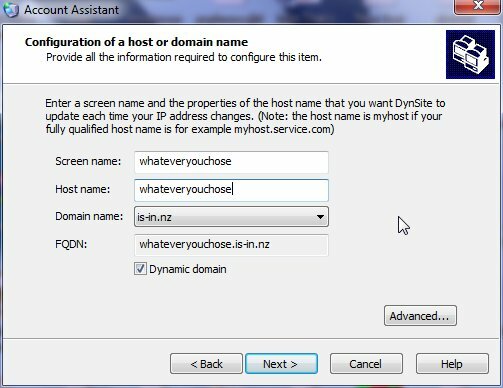 Below are instructions for how to proceed in order to add your account with us in DynSite. Once you have started Account Assistant you click Next to continue. 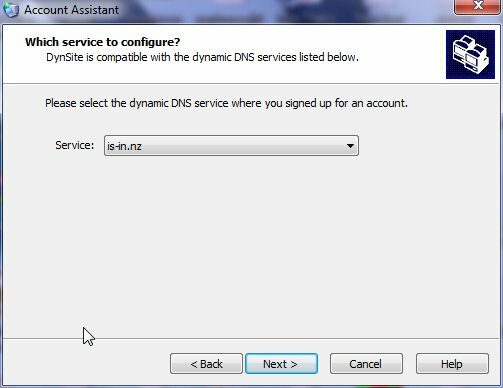 Select Dynamic DNS Services as Server type and click Next. Locate is-in.nz in the drop-down menu Service and continue by clicking Next. Select Configure a new account and then enter a name for your account, for example iwhateveryouchose. Then click Next to continue. In the field Login you enter the username you have with us, for example whateveryouchose. Then check the box This service requires a password and enter the password you chose when you signed up in the fields Password and Confirm password. Check also the box I want to configure a host for this account and click Next. In the field Screen name enter a name for the address / domain you should add, for example whateveryouchose. If there is a subdomain you want to update, enter the subdomain in the field Host nameNext to continue. You have successfully added an account in DynSite and added the domain / subdomain to be updated. Click Next to continue and then Finish. When the program runs there is a small icon at the bottom right of the screen next to the clock. If you double-click on this icon you will get the status window as shown above. In this window you can see all domain names / subdomains that are updated and if any errors have occurred.